The unfortunate part about not currently having a roommate or many friends in the city is that I haven’t been baking as much as I would like. It doesn’t make sense to bake a cake or cupcakes when I would be the only one eating it, so I haven’t. 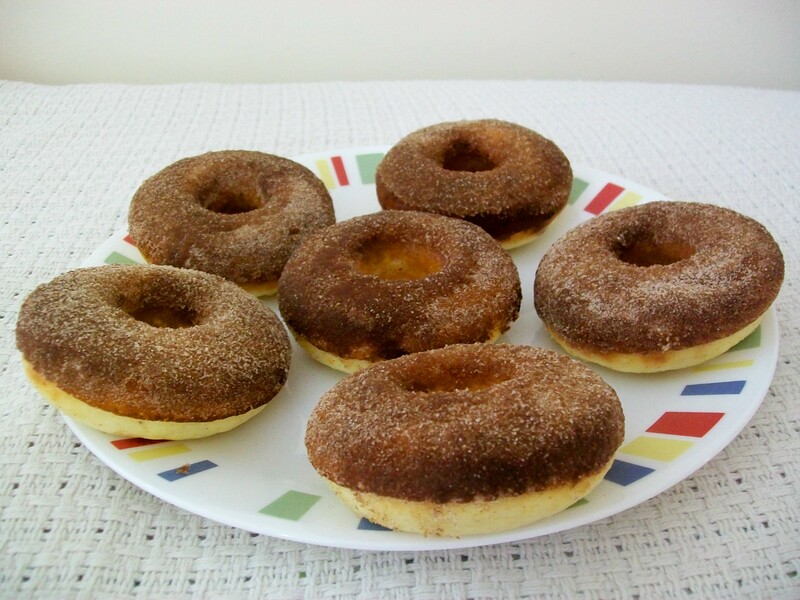 Instead I’ve just been making doughnuts every so often, since most recipes only yield about six, which is much more acceptable than twenty-four or an entire towering pan. I’ve been craving cinnamon rolls, lately, but it would be silly to make even a half batch of them just for myself. All of that butter and sugar is just crazy to consume alone. However, I found the next best thing with these Cinnamon Sugar Doughnuts from Table for Two. The really nice thing about baked doughnuts is that they rarely call for much butter or oil, so I can make a batch and eat them over a few days for breakfast or dessert without feeling quite as badly as I would if I had made the cinnamon rolls. 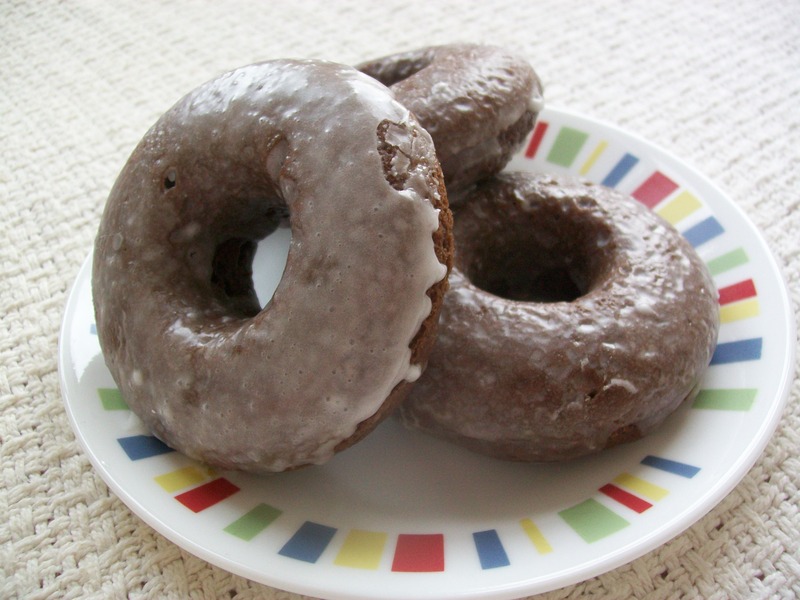 These doughnuts are pillowy delights of deliciousness. They rose beautifully in the oven, and I think that’s because they call for a higher baking temperature (450*) than other doughnuts I’ve made. They also stuck to the pan a bit, but not so much that they fell apart or lost little chunks upon extraction. I was also a bit heavy-handed with the cinnamon sugar coating, which slightly overshadowed the flavor of the doughnut. I enjoyed it though, because in this instance I wasn’t really looking for a doughnut, but rather a vessel to deliver copious amounts of cinnamon. I thoroughly enjoyed every bite, and I think I might revisit this recipe for future cravings. Have I expressed how much I truly love my doughnut pan? It might be one of my favorite kitchen items of all time. I’ve used it so many times that I’ve lost count. 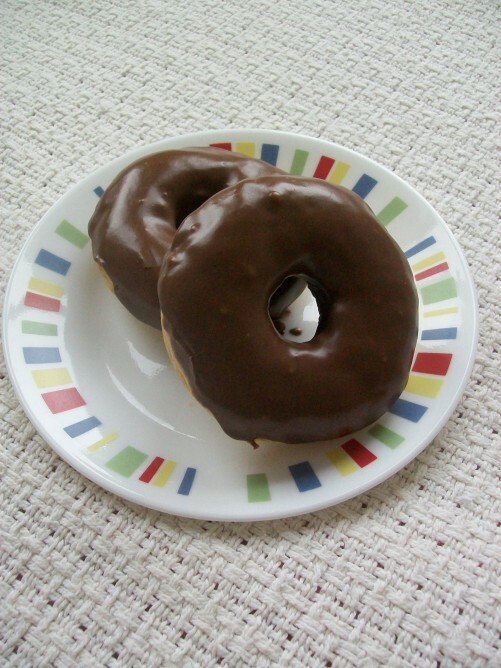 I don’t often branch out and post different recipes, though, because the ones I have for plain and chocolate doughnuts are perfect for my taste. However, I really wanted a doughnut this morning, but I wanted something more than my regular recipes offer. 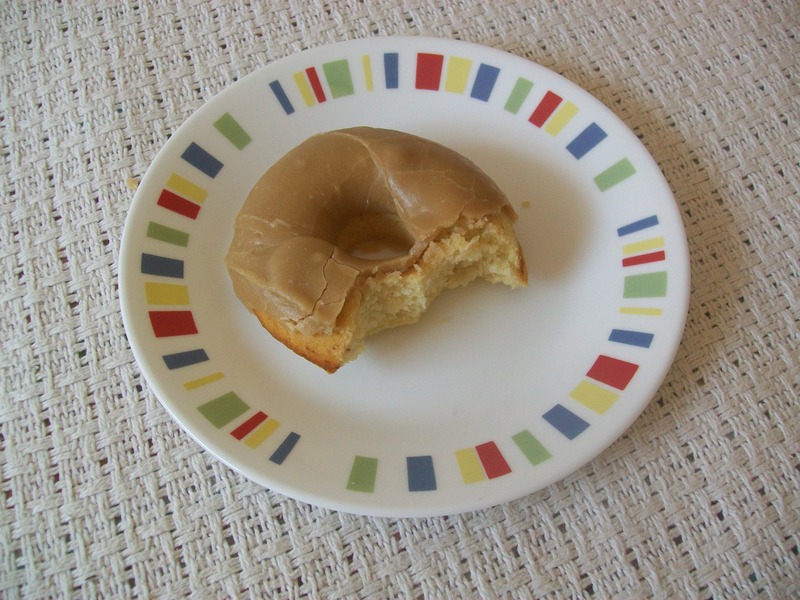 I found these Caramel-Glazed Baked Doughnuts from Namely Marly and loved the premise, so I tweaked the recipe to suit the ingredients I had on hand. I wish I could say they were amazing, but I can’t. 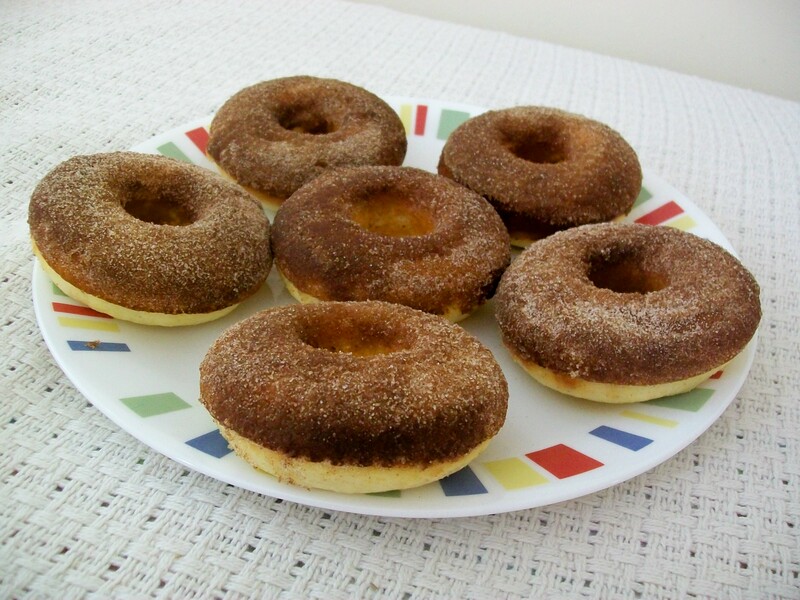 While my version baked a lovely doughnut, I still prefer my other recipes. 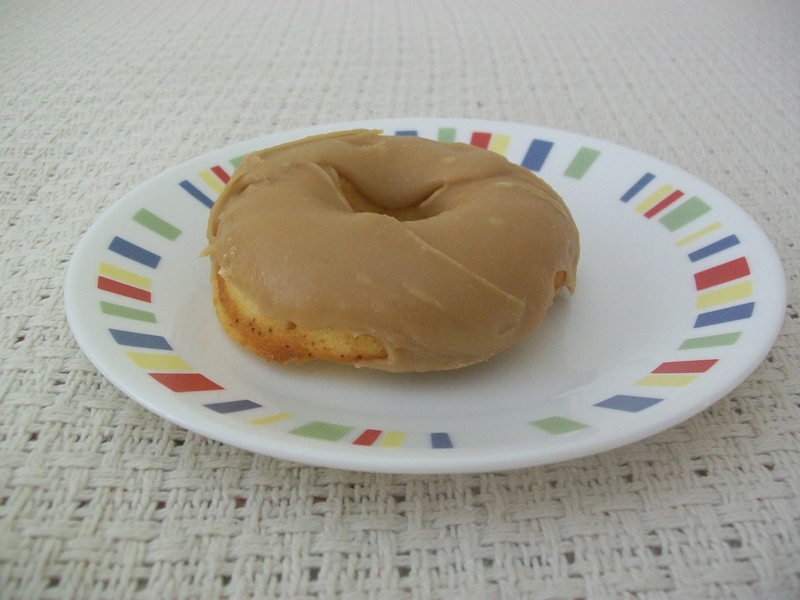 I encountered some trouble with the caramel glaze because it started to solidify before I could even top the doughnuts. It was more caramel-y than glaze-y or frosting-y, so it didn’t make a very smooth coating like I wanted. Also, when the doughnut and coating came together, the sweet caramel overwhelmed the doughnut flavor, and even plain it didn’t have that distinctive doughnut taste. The original recipe didn’t call for nutmeg, so I added a little shake of it to see what would happen. Nothing really happened. Preheat the oven to 350*. 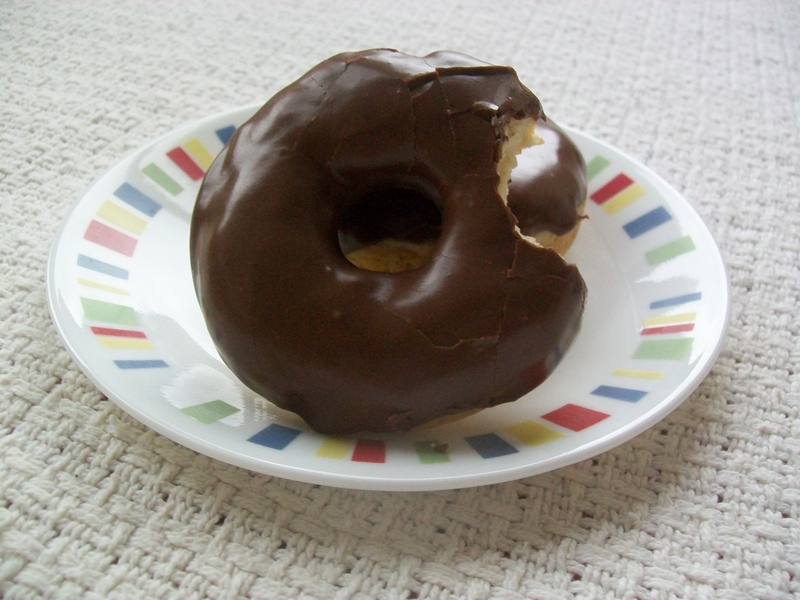 Grease or spray a doughnut pan. Mix together the sugar and butter in a medium bowl. Add the egg and mix together to incorporate. Add the buttermilk and vanilla and mix to combine. Add the flour, yeast, and baking powder to the wet ingredients and mix to combine. Try to get rid of the lumps that form, but a few remaining is fine. 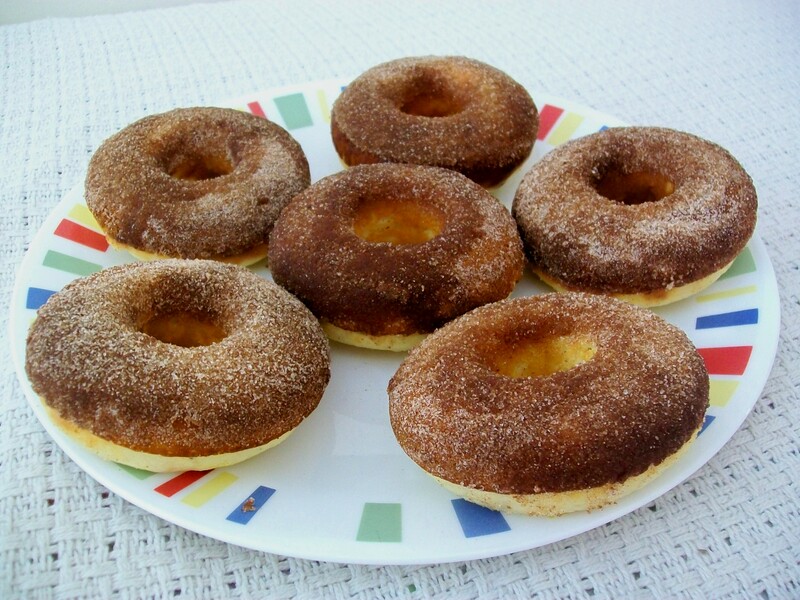 Spoon into the wells of the doughnut pan and bake for 10 minutes. The tops will still be very pale, so be careful to not over bake. Over medium to medium-high heat, bring the butter and brown sugar to a boil in a small saucepan. Let boil for 1 minute and then take it off the heat. Add the powdered sugar 1/2 cup at a time and mix until combined. Last year I was crazy busy beyond belief, and I can’t say that I’m sorry 2011 is over. This semester seems like it will be a bit calmer, but I have to say that I’m definitely going to miss interning at Little Simon. My time there was such an experience and I learned so much that I can actually apply to my future career. But, new year, new endeavors, new experiences. Bring it on! Speaking of new things, I ordered a doughnut pan during winter break and broke it in this morning. I have been looking for the perfect recipe with which to christen this pan, and Lara Ferroni’s Baked Chocolate Doughnuts fit the bill perfectly. Everything came together very quickly and easily. I had to substitute milk and vinegar for the buttermilk, and I don’t think the final results suffered one bit. I also replaced the yogurt with my “buttermilk,” as I’m not sure if Greek yogurt would have worked properly in this recipe. 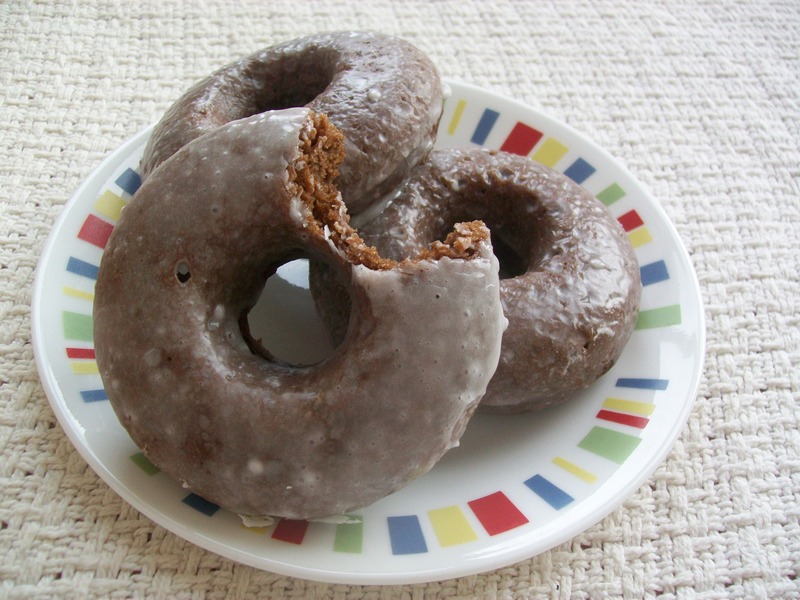 With these doughnuts, I finally did realize that it IS the nutmeg that MAKES the doughnut taste. I’m coming around to this particular spice, especially with this recipe. I didn’t use my buttermilk substitute for the glaze, but I think it works with just plain old milk. I did add a bit more milk than I should have, so I didn’t get the thicker glaze/frosting that Lara’s had. It’s fine though. This one reminds me more of the Dunkin Donuts glaze. 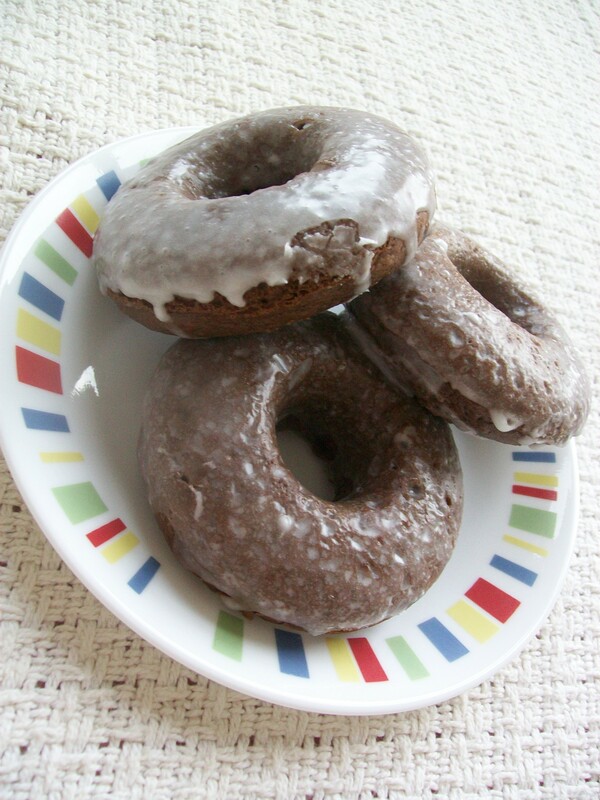 When I next make chocolate doughnuts, I think I might use my brand new dark cocoa powder. I would like to have a chocolate-ier flavor, more akin to a chocolate cake/cupcake. 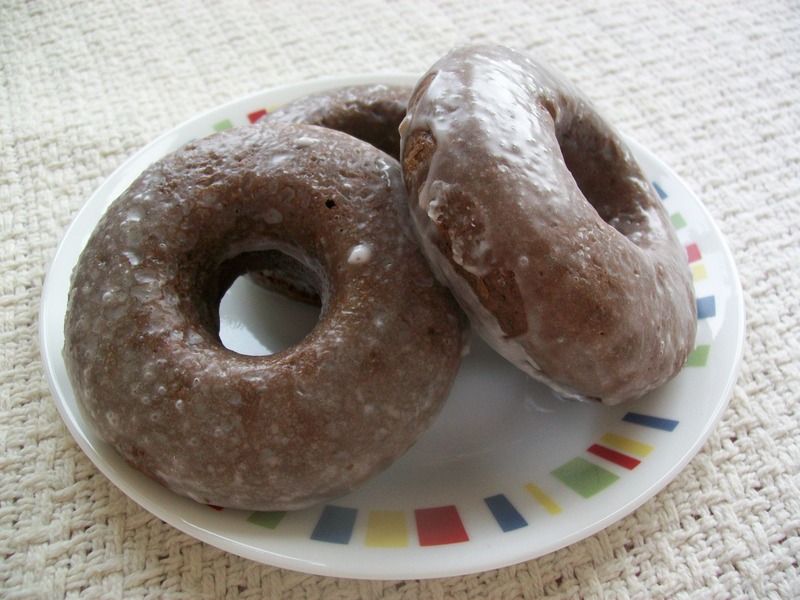 I know that pretty much defeats the purpose of making doughnuts–I mean, why not just make cake–but I want to somehow replicate the DD’s chocolate glazed doughnuts. So good! 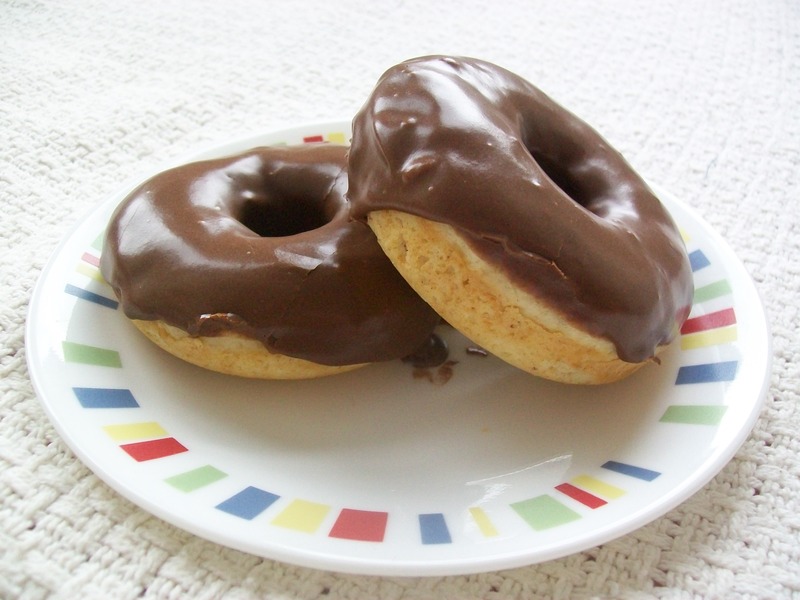 I think next week I’ll try a plain vanilla doughnut and jazz it up with a chocolate glaze. After that, the options are absolutely endless. 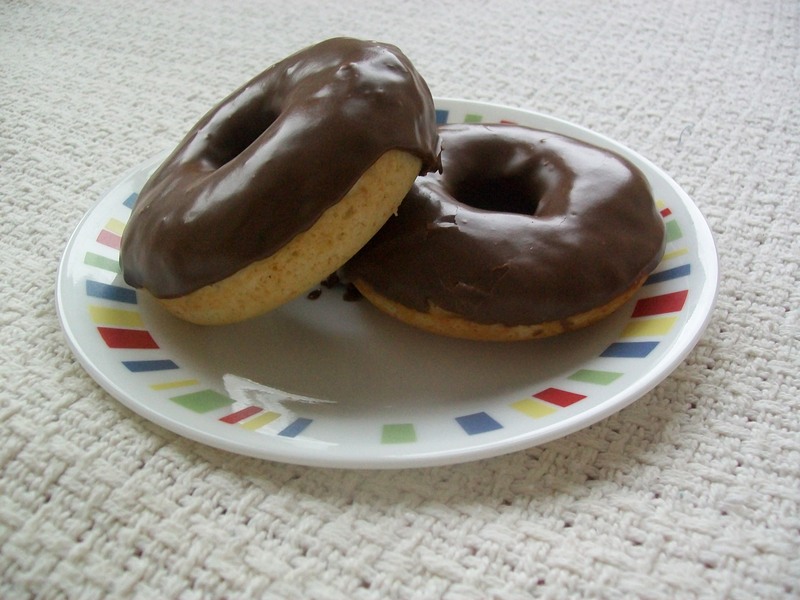 Reese’s Cup Doughnuts, anyone?